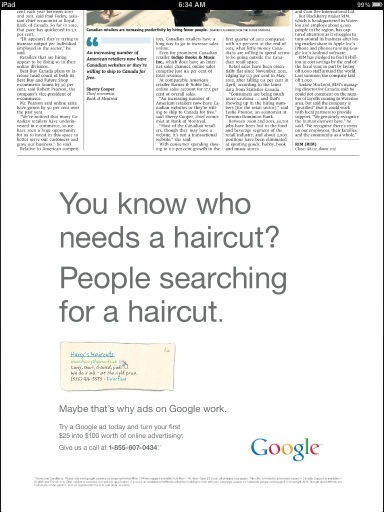 Here’s a nice bit of multi-faceted irony for you: On Thursday, Canada’s Globe and Mail newspaper ran a print ad for Google’s (directly competitive) search advertising business. Google’s ad ran in both the Globe‘s print and digital editions, as well as in the National Post, the Globe‘s main competitor, Ladurantaye tells us. But hey, at least Google is supporting newspapers, right? Digital Advertising: Mobile Or Desktop? Are Your Sure About Your Website Security? Online shopping won’t “kill” retail, but has changed it forever. Here’s how brick and mortar retailers can take advantage.